The town of Luang Nam Tha in northern Laos is perched along the fringes of Nam Ha National Protected Area—2,224 square kilometers of rolling jungle-clad mountains. Many companies offer guided treks through the jungle, and though we had avoided the more popular trekking scene in Thailand, we wanted to get further into this amazingly beautiful countryside. Mist fills the valleys of Nam Ha National Protected Area. 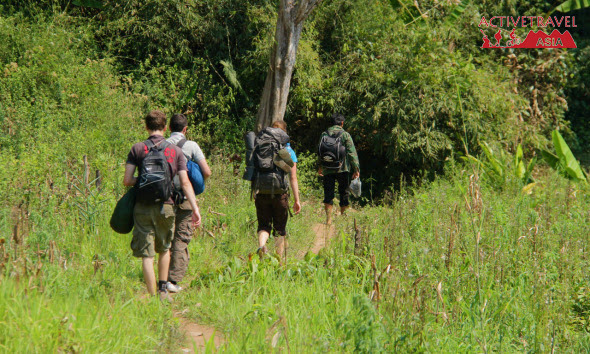 The three-day more challenging trek took us across about 25 kilometers of jungle. Four guides came with us and three other trekkers—two guys from England and another from Sweden. 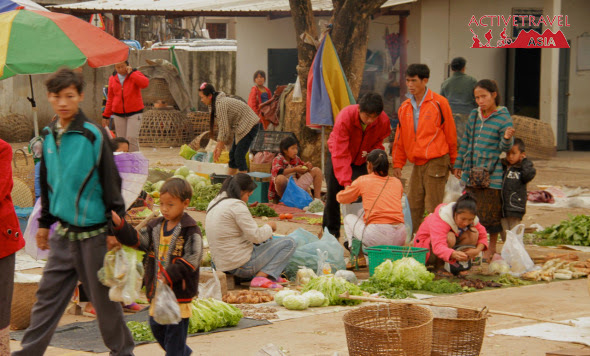 Banmi (red jacket) and Gang (orange jacket) purchase our food at the morning market. 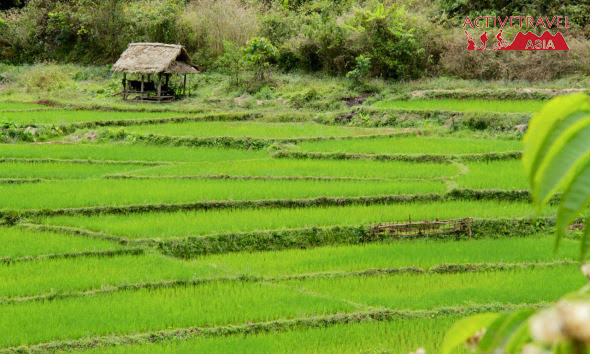 The trail started at Kahm’s and Pung’s Khmu village, passing shy children, countless chickens, and vibrant green rice fields before entering the forest. We hiked for about six hours each day, up and down hills, across fallen logs, through dense patches of vines. Throughout the three days, we caught glimpses of Nam Ha’s rolling blue-green hills through the dense jungle branches. Ignoring the foreground, the layers of faraway mountains looked remarkably like Vermont, or perhaps somewhere in the southern Appalachians. It was a bit surreal to see a small slice of home on the other side of the world. 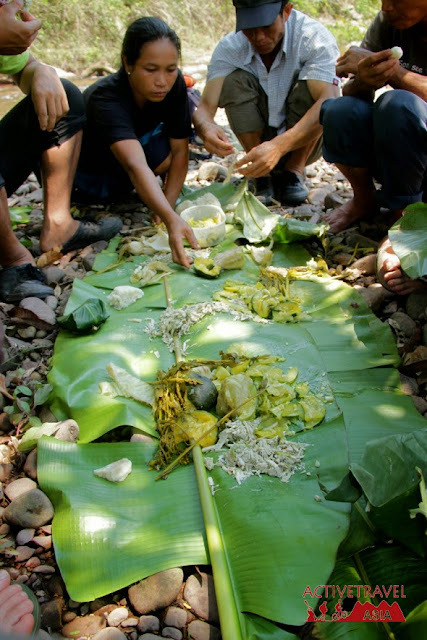 Far from the basic hiking fare we had expected, every meal brought an elaborate spread of tasty Lao dishes, arranged across a banana leaf table. We dipped small balls of sticky rice into fried young morning glory, garlicky tomatoes, mixed vegetables infused with ginger, eggplant and chilies, and buffalo meat bought from the morning market. In particular, dinner on the second night consisted mostly of food our guides had collected as we hiked through the jungle—banana flower, young ferns, bitter eggplant, greens. Everything was delicious, and not just because we had been hiking for hours! After a full day’s walk on the second day, we reached camp in a small valley next to a river, and everyone enjoyed a much-needed swim. At night, we all sat by the campfire after the guides, who rose and slept with the sun, had gone to bed. The full moon crept above the forest and illuminated the camp, almost eliminating the need for a flashlight. Early the next morning, mist filled the valley and shrouded the mountains, until the sun cleared the tallest peaks and melted it all away. Soon, the sun blazed down on us as we made our way through a more open section near the end of the trail. We followed the river, crossing it in our flip-flops again and again. Looking back towards camp on the last day. 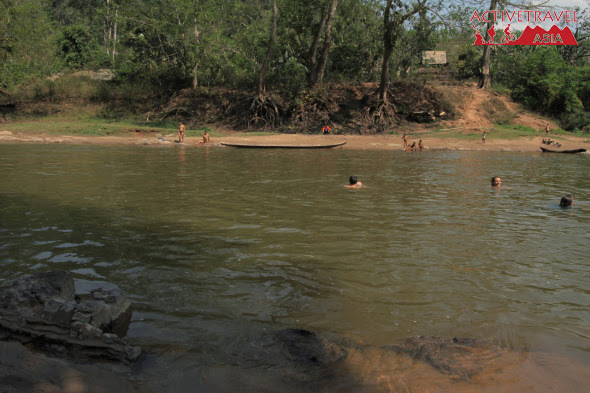 The trek finished at a village on banks of the wide and deep Nam Tha (meaning Green River). Our bags were ferried across while we swam— very welcome after the long, hot third day. Nearly a dozen village kids swam too, barreling down the hill and leaping into the river as recklessly as they could, with plenty of yelling. Everyone enjoying a swim in the Nam Tha. Aside from three leeches (me, gross), two ticks (me as well), an incident with a bare foot and a huge, fresh buffalo patty (Banmi), and some very sore legs, the trek was a definite success. ACTIVETRAVEL ASIA would like to recommend Trek Nam Ha Forest Camps, Luang Namtha tour.This trek is entirely within the Nam Ha National Protected Area, an ASEAN Heritage Site. The 3 days trek is entirely in the forest. This is a trip for those who want a true forest experience. 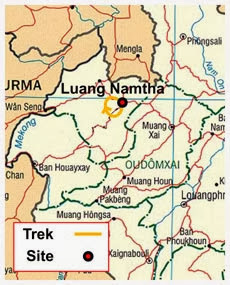 The villagers of a Khmu village will host us at our first forest camp deep in the forest. At the second camp Akha villagers will be your hosts. The camps, built out of bamboo and wood by the villagers themselves, are places to immerse oneself in the beauty of the jungle. Along the way, local Khmu and Akha guides will explain the forest products used by villagers for food, medicine, materials and religious ceremonies. Rise early on the third day for the sunrise and go with an Akha bird caller to learn how the Akha can call wild birds in.